With spring just around the corner, Rosewood Hotel Georgia is delighted to announce that Reflections Outdoor Restaurant & Lounge will reopen for the season on April 1, 2014. Featuring sleek teak furniture, exclusive cabanas and a striking peak-through to the Vancouver skyline, Reflections is one of Vancouver’s most romantic and intimate venues. This year, the elegant al fresco rooftop bar and lounge will shine the spotlight on romance with a new Proposal Package launching in time for the start of the Reflections season. To help create the perfect engagement celebration, the new package includes a luxurious private cabana filled with rose petals, champagne and chocolates, as well as the chance for the newly engaged couple to win a free* wedding at the historic hotel. 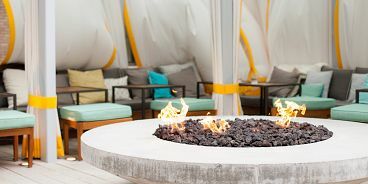 Available to hotel guests and Vancouverites alike, Rosewood Hotel Georgia’s new Proposal Package invites romantics to pop the question surrounded by the lounge’s roaring stone fire pit, soothing infinity water features and flowing art installations. For those looking to bask in their newly engaged bliss, the Proposal Package also offers the option of adding an overnight stay with breakfast in bed and a couples massage at the Five-Star Sense, A Rosewood Spa. To celebrate the memorable proposals, guests who book the Proposal Package will be entered to win a free, 80-person wedding at Rosewood Hotel Georgia in the stunning Spanish Ballroom through a Facebook competition. The winners of the Facebook contest may either accept the free wedding at the hotel or opt to host an engagement party or stag/stagette party instead. In addition to the new Proposal Package, Reflections will re-open with an entirely new locally inspired light-bite menu to kick-off the 2014 season. Led by Head Chef Ken Nakano, this year, the culinary team has created a Spanish-inspired, locally sourced tapas style menu. Highlights include: Oyama’s Spicy Chorizo with Fennel and Salt Spring Island Mussels, Green Pea Croquetas with Mint Yogurt and Chef’s special grilledWe Wai Kai Scallops with Arugula and Romesco. New and original cocktails including the South Side and the Mexican Fix complement the fresh fare. Remaining on the menu is the ever popular Hotel Georgia, which was named ‘Cocktail of the Year’ in 2012 by enRoute Magazine. A carefully curated wine list offers global selections with an emphasis on boutique BC wines, quality and value. Reflections is open daily from noon until late. For reservations, please telephone 604.673.7043 and for menus and more information on the new Proposal Package visit www.rosewoodhotels.com. *The free wedding is non-transferable and for up to 80 people and inclusive of a preselected set of menus and non-alcoholic beverages. Any additions/changes are chargeable. The Spanish Ballroom is subject to availability and it is at the discretion of the catering department to negotiate availability. The wedding would have to be booked by December 31, 2014 to take place by December 31, 2015.